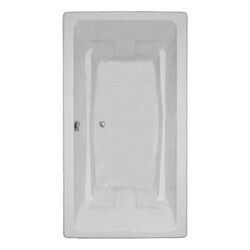 The Barrett 6642 is a drop-in bathtub with clean geometric lines and integral armrests. The Barrett can also be under-mounted. Includes two pillows. Available as a soaking tub, whirlpool tub, air tub, or air/whirlpool combination. Call 800-720-1062 for more information. 42" x 66" x 24"
Dimensions: 66" x 42" x 24"